I still haven't gotten out my Christmas tree and decorated for Christmas. My goal was this weekend no matter what. Still didn't happen. 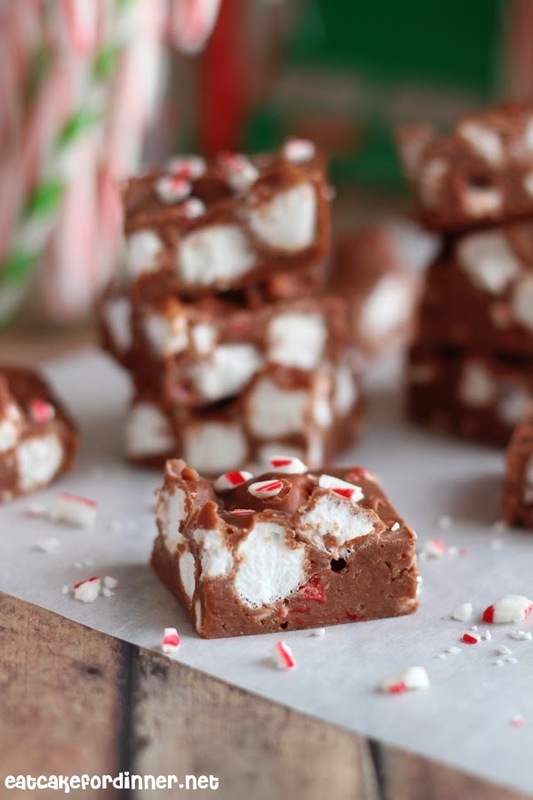 Last year, I made this Super Easy Microwave Rocky Road Fudge and it quickly became a favorite recipe. I obviously needed some more variations of that easy microwave fudge. Candy canes were the first thing that came to mind, because peppermint and chocolate is a classic combo. This is the kind of fudge that gets you in trouble, because you CAN NOT stop eating it. It is rich and creamy and melts in your mouth. 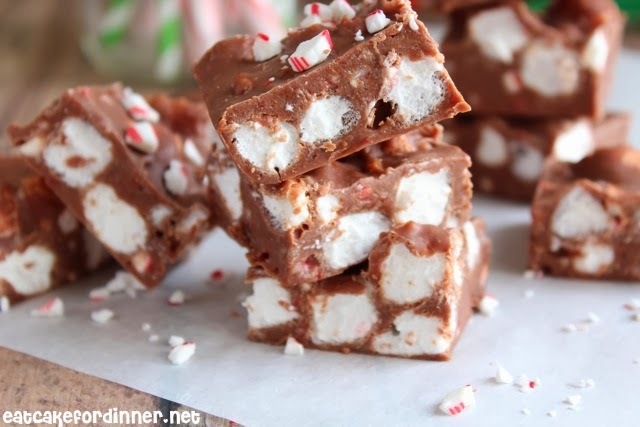 It has the perfect amount of candy canes, just enough to give a light peppermint flavor. They soften up and have just a slight crunch. This fudge is so easy even your husband could make it :) It really is a No-Fail recipe. Line a 9x13-inch dish with parchment paper and spray lightly with cooking spray. Combine chocolate chips and sweetened condensed milk in a large microwave-safe dish. Microwave until chips are melted, stirring every 30 seconds. When completely melted, stir in the vanilla extract. 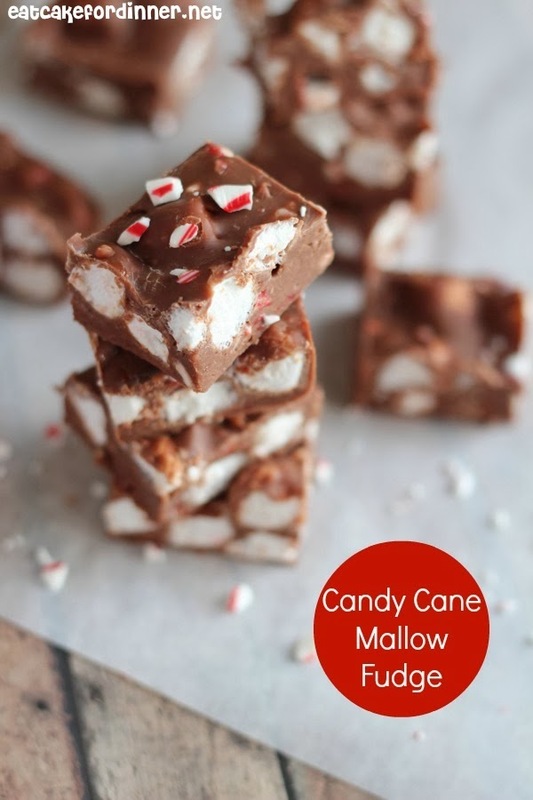 Add the marshmallows and crushed candy canes and stir together until well combined. Spread evenly into prepared baking dish. Refrigerate until set. Lift from pan and cut into squares and serve. Store any leftovers in an airtight container in the refrigerator. * To crush candy canes: Unwrap, break into a few large pieces and place in a large zip-top bag. Place bag over a folded kitchen towel. Pound candy canes with a rolling pin until they reach desired size. Jenn's Notes: I sprinkled crushed candy canes over half of my batch and the next morning, the candy canes were melted, so I wouldn't recommend doing that. Linked up at Weekend Potluck and Linked up at Inspiration Monday! OMG how tasty it is!!!! Like everything chocolate and everything with marshmallows...this is definitelly great recipe!! Super Addictive - thanks Tanya! Guittard chips are my FAVORITE chips ever! Wish they weren't so expensive :) This fudge looks amazing Jenn! Pinned! this looks yummy! i love your logo! Awesome, awesome, awesome! Taking for "The week of gluttony" at work tomorrow, they are superb. I doubled the recipe and still couldn't fit all the marshmallows in, but it is great. Thanks! I am so glad you liked them! That is weird about the mallows - I guess I like a lot of them? It really just depends on how large you cut the pieces, but you could easily get at least 42 pieces (6 rows x 7 rows).